During their 2016 annual meeting in San Diego, Society for Neuroscience (SfN) held a two-hour session dedicated to public outreach concerning animals in research. The panelists offered different perspectives on communication about essential animal research for the public. The session opened with remarks by the chair of the SFN’s Animals in Research Committee, Dr. Mar Sanchez, who stated the importance of the role of scientists in raising awareness about animal research. Sanchez encouraged the audience to immediately take action by signing up to advocate for biomedical research by reaching out to their elected officials. The first panelist, Kirk Leech, is the Executive Director for the European Animal Research Association. Leech overviewed the current state of opinion about animal research and shared how the UK and other European countries are helping to be more transparent. He pointed out that although physical attacks by activists have decreased, their tactics have become more complex and influential. He said that “it is essential to engage with the public, media and policymakers about animal research.” Aim of the panel was to explain how for example in Spain, Belgium and the UK we have sought to use Institutional Openness, – private and public research agreeing to certain principles about how they will seek to improve public understanding of animal research. If the voices of the research community are not heard, the conversation about animal research will continue to be driven by anti-animal research rhetoric. Dr. David Jentsch, professor of psychology at Binghamton University, began by insisting that today’s activists remain extreme and sometimes abusive, even though they are legal. He noted that although they are not bombing cars and breaking into labs, they still are making a very real impact on the scientists they target through campaigns that involve personal targeting and harassment. After overviewing the players in current activist campaigns, and their tactics, he pointed out the results of their activities. These included researchers ending controversial projects, graduate students pursuing alternative pathways, funding not being applied for or lost, and the endless waste of resources being spent on having to respond to frivolous activist campaigns. Jentsch shared his perspective through the lens of a researcher about engaging with the public about work with animals in research and working with your institutions, scientific societies and advocacy groups to implement a proactive campaign. He says that, “Researchers can, and should, be proactive and plan for public engagement about their work.” He recommends that the scientific community proactively navigate this reality by planning, finding their own voices, controlling the message, and demanding specific forms of institutional support. He points to examples like Edythe London’s personal and emotional defense of her own research in a LA Times OpEd as an excellent example of transparent and effective advocacy. 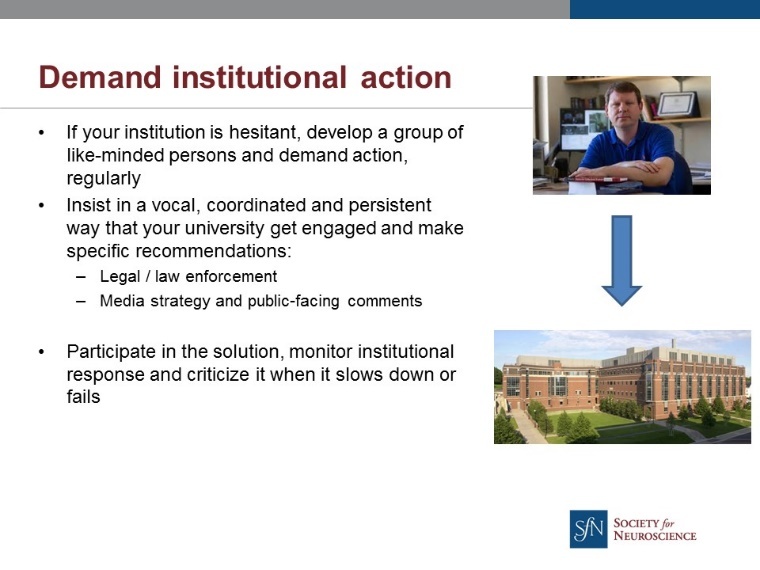 Additional advice includes preparing in advance for negative criticisms, participating in public communications through blogs, letters, and websites, and forming a group of like-minded individuals at your institution to encourage public statements and protection for researchers. He closed by sharing a solemn voice of support thanking the research community for its research and advocacy. The next panelist, Dr. John Morrison, Director of the California National Primate Research Center, highlighted the outstanding care that nonhuman primates at the seven National Primate Research Centers (NPRC) in the US receive, as well as the significant contributions non-human primates have made in the advances of such diseases as HIV/AIDS, polio, Ebola, and Parkinson’s disease. Morrison stressed that, “hiding doesn’t work.” He encouraged the development of strong proactive messages that emphasize the connection to human health and to get this message out as often possible. Some venues for message distribution include giving tours and presentations, using the website and social media, developing press releases, and engaging with all partners. 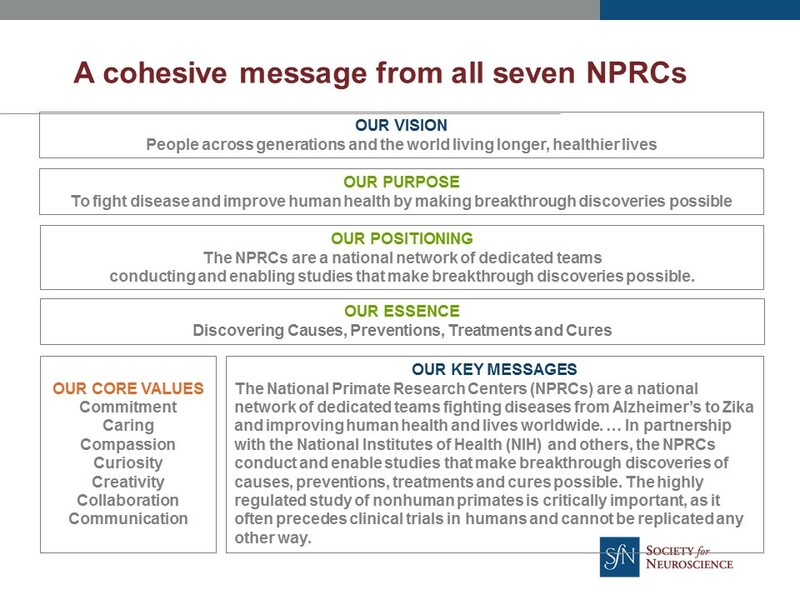 He says, “engage your press office and publicize science as often as possible.” Morrison shared a cohesive message being shared by the seven NPRCs which includes, “The National Primate Research Centers are a national network of dedicated teams fighting diseases from Alzheimer’s to Zika and improving human health and lives worldwide.” This cohesiveness gives strength to their communications about essential research with non-human primates. Engage the highest level of leadership in a social setting to present scientific discoveries and their importance to human health and the financial impact of research for the institution. Morrison emphasized, “In all of these interactions, emphasize the power of animal research to impact human health.” His talk ended by showing a powerful video of a man with Parkinson’s disease and the medical advancement that gives him the ability to function normally. Without the deep brain stimulation developed through the nonhuman primate model, this man could not even hold a pencil. The final panelist, Dr. Carrie Wolinetz, Associate Director for Science Policy and Director of the Office of Science Policy, National Institutes of Health, began her talk with an overview of NIH and related agencies. 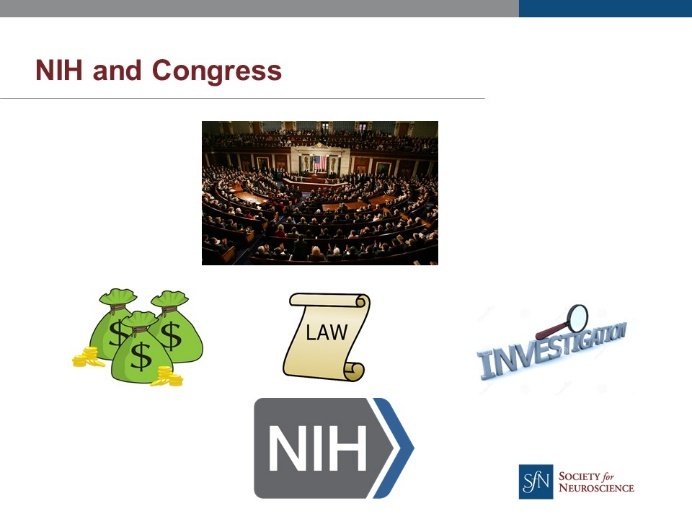 She also explained NIH’s relationship with Congress and the fact that since they are a public agency, paid for by all taxpayers, they represent the view of the entire public, including those that may oppose animal research. This representation of all members of the public is what results in things like the September 7th workshop to review its ethical policies and processes for the nonhuman primate research model. She assured the audience that Dr. Francis Collins supports their work with animals. Discussions about hosting another panel next year are underway. Ideas for topics to include can be emailed to the Chair of SfN’s Animal Research Committee, Mar Sanchez, mmsanch@emory.edu. Posted on November 28, 2016 November 29, 2016 by EditorPosted in News, Outreach News, SR NewsTagged Animal research panel, Annual Meeting, SfN, Society for Neuroscience.